FoodLogiQ, LLC, and Testo, Inc today announced a partnership to pair the global leader of portable HACCP and IoT capabilities with the food industry’s leading supplier management, traceability and recall management SaaS platform, raising the bar for food safety and quality around the world. The partnership paves the way for an integration between Testo’s Saveris Quality Management capabilities and the FoodLogiQ Connect platform. 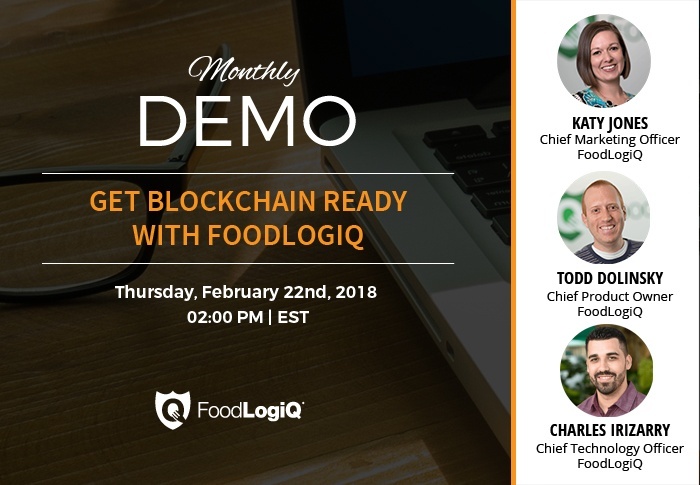 Join FoodLogiQ for a live demo on Thursday, February 22nd, 2018 at 2:00pm EST and learn what blockchain is, what it isn't and what it will take for blockchain to be successful in the food supply chain.